His first appearance as president in a state that was a getaway for his predecessors could instead become a political test for Obama, whose administration has been trying to find its voice on the economy. President Barack Obama heads to California today, where he will preside over a couple of town hall-style meetings and become the first incumbent chief executive to appear on "The Tonight Show." The visit comes at a time when California is being hit hard economically. The state that is home to one in eight Americans has been ravaged by recession, a housing meltdown and double-digit unemployment. The public is seething over $165 million in post-bailout bonuses paid to executives at American International Group Inc. — an issue certain to overshadow the two-day visit. His first appearance as president in a state that was a getaway for his predecessors could instead become a political test for Obama, whose administration has been trying to find its voice on the economy. His schedule includes a stop on Jay Leno's stage in Burbank after town hall-style meetings in Orange County on Wednesday and downtown Los Angeles on Thursday. With the furor over the AIG bonuses, "if he doesn't have some really good answers, this could be a nightmare. It's not going to be enough to say, 'I feel your anger and we are looking into it,'" said University of California, Berkeley, political scientist Bruce Cain. "There has to be some sort of decisive action." Judy Chen-Lee, a laid-off job counselor for the city of Santa Ana, has a ticket for the Orange County event and hopes to press the president about getting people back to work. The economic stimulus money should be "dedicated to those most in need, who need jobs and retraining," she said. "The AIG situation is sad. There needs to be accountability." Normally, a trip to the Democratic-leaning state would represent a welcome respite for a Democratic president. Clinton was here more than 70 times during his presidency, often to attend lavish political fundraisers with his golf clubs in tow. Obama, who spent his early college years in California, won a 24-point victory here in November and his administration is thick with Californians. National surveys show Obama remains personally popular, despite some unease over policy. But recent polls confirm the obvious: At a time of economic stress residents are anxious, frayed. California is at the center of the mortgage crisis, and the number of residents fleeing the nation's most populous state has been rising. The state will be a key to any national recovery; California on its own is the world's eighth-largest economy. Obama's green jobs agenda is similar to ideas being pushed in California. His stop on Leno's couch will mark the first time a sitting president has hit the late-night talk show circuit. Leno is known for banter and laughs, not grilling politicians, so it will give Obama a deferential platform to talk about the economy. The show has about 5 million viewers — a Main Street audience mostly beyond the Beltway. The message on the economy has appeared to shift. During the fall presidential campaign, Obama relentlessly criticized his Republican opponent, Sen. John McCain, for declaring, "The fundamentals of our economy are strong." But last weekend, a White House adviser said the economy is fundamentally sound despite the temporary "mess." Just a week ago, Peter Orszag, director of the White House Office of Management and Budget, declared that "fundamentally, the economy is weak." Days later, Obama told reporters he was confident in the economy. 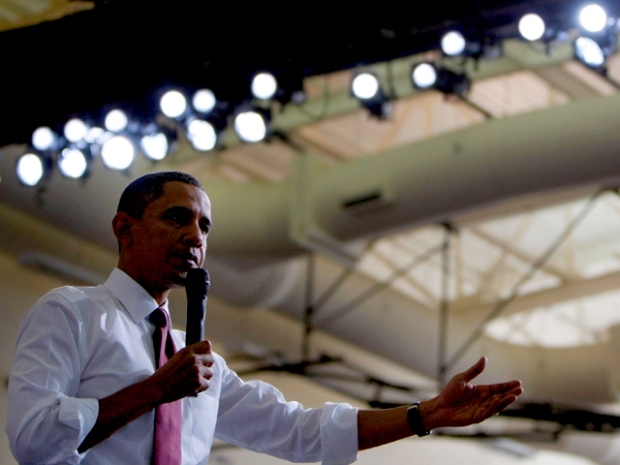 How much Obama — or any president — can do during an economic slowdown is always in question. "The economy everywhere is in big trouble, and these are problems that started long before he came into office," said Christopher Thornberg of Beacon Economics in Los Angeles. "Obama doesn't walk on water. He can't wave a magic wand and fix all that." When Reagan occupied the White House, his first Air Force One trip was to California for a weekend at his ranch in the Santa Ynez mountains northwest of Los Angeles. When Nixon was in office, his seaside home in San Clemente became known as the Western White House, a hideaway during a turbulent presidency. Obama is popular in reliably Democratic Hollywood, and money from the entertainment industry helped finance the richest campaign in presidential history. When asked whether Obama planned to meet with any celebrities on his visit, White House spokesman Nick Shapiro declined comment.